you’re open, seeking and want to learn. And, you are in pain. I know that because you are here; exploring and wanting. You want to move beyond your pain. You want a relationship of TRUST, honesty and mutual acceptance and respect. He refused to stop seeing and talking to her and became increasingly critical of Abby. And, get this: he even asked for Abby’s support and understanding! Abby was like, “Huh?! !.” but also fearful that if she exploded or withdrew her “support” he was a good as out the door and with his lover. Of course Abby was confused, angry, felt helpless and terrified. In that session I was very intentional in affirming Abby’s inner strength and began planting seeds of what she might say that had the best chance of helping her feel better and impacting her cheating husband. In the following week she began to set boundaries, create “space,” make meta-comments and charge neutral as well as monitor what was brought up in her. 14 days after our session, Abby’s husband wanted to set a time to talk to her. He told Abby he had completely broken off the affair and wanted to work on the marriage. Is this an unusual case? No. Actually it’s fairly typical. Tracey and her husband were at a standstill and had been for a long time. They lived together, were cordial and didn’t talk about the elephant in the room. Tracy and I talked about confronting the affair or the elephant, without blowing everything out of the water. Thank you for talking to me this past Tuesday. I was a bit of a mess with trying to get everything sorted out in my mind, but I believe that I am thinking more clearly now. Last night the opportunity presented itself to say something so I did. It went something like this: I said in a calm, non confrontational way…”I just wanted to let you know some things that Alexa (our daughter) has been asking me that I am not sure how to respond to. I told him that she commented that “Daddy has been going out alot with his friends” and that last night when he was out she asked “Is Daddy coming home tonight?”. I told him that the first thing this morning she asked me was “Did Daddy come home last night.” He sat there not saying much. But I felt better. …we will see what he does with it. I also at some point mentioned, again calmly, in response to something he said, “wherever you go and whoever you go with”…to let him know i wasn’t buying the whole “out for beers” excuse. 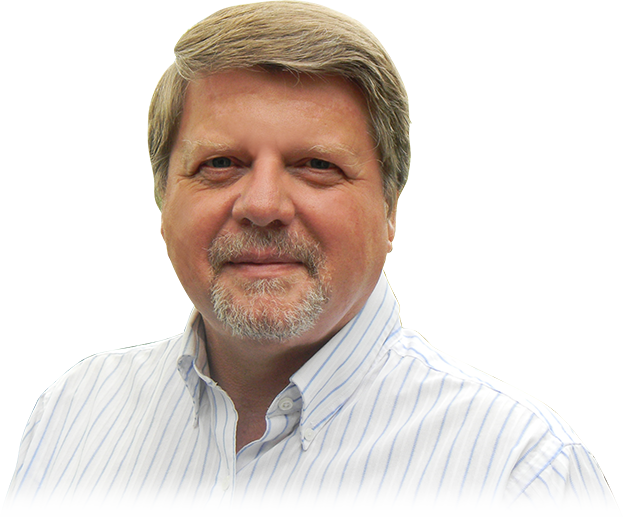 I’ve spent a professional lifetime as a Marriage and Family Therapist – over 25,000 direct client hours and hundreds of hours of supervision and training. Back in the late 90’s I was baffled by many couples who refused to budge. I was working with a couple one day; the wife dragged her husband into my office by the ear and proceeded to ream him out for not spending enough time with her, being distant, etc. He sat there like a stiff post, being nice but divulging absolutely nothing. The wife hinted at another person. That was it! He was having an affair, but for religious, business, personal and community reasons would not come close to admitting it. That was their last session with me. They were stuck. And, I was stuck. So, I embarked on research, study and implementing new strategies with couples whom I suspected were struggling with infidelity. I began to understand. I began to see patterns. My therapy became more powerful. 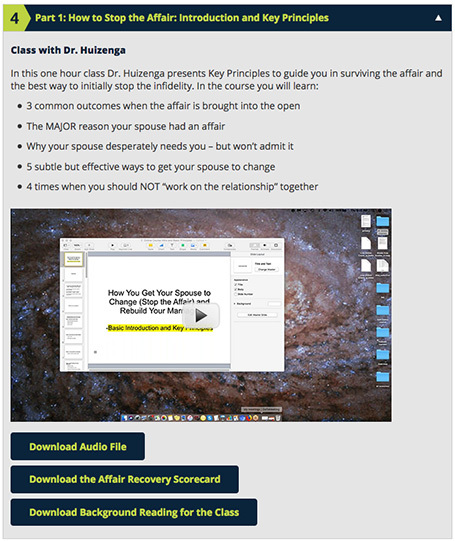 Much so, that in 2001 I wrote the first Ebook on Infidelity, “Break Free From the Affair,” a comprehensive extensive outline of 7 types of affairs and how each can be addressed. I sold thousands of copies and the testimonials poured in. 48 hours…that’s all I want from you now. During these 48 hours I want you to take a break from thinking about the affair and them. 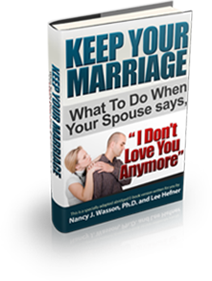 I want you to shift your focus away from your cheating spouse to yourself. If I stop being there for him/her; if I stop trying, I will lose him/her. You may have those fears, but, believe me, work with thousands of couples informs me that those fears are not founded. In reality, taking a 48 hour “break” most likely will pique your cheating spouse’s interest. And, 48 hours is NOT a long time. Look at the larger picture: thoroughly working through an affair takes 2-4 years (without expert guidance) and often 6-18 months with guidance and making significant changes. So, relax a little, take a deep breath and commit to 48 hours. Have you experienced anything as excruciatingly painful as discovering your partner is cheating? The affair brings up pains, urges, images and fears that you thought never existed. But, they are there, real and powerful. And, if like most, you resort to your personal default mode to cope. But here’s another problem plopped on top of your pain: what you do to get away from your pain – your default mode (argue, rage, beg, please, cry, become depressed, freeze, etc.) – gives your cheating spouse an excuse to continue their affair! And, you become with force the person you truly don’t want to be and the person you truly are not. Or, the affair will end and you will live together in a cold untrusting marriage. I’ve identified 5 areas common to infidelity suffering and have developed resources for each. These 5 areas are your focus for the next 48 hours. Your pain comes from the 6 inches between your ears – what you think about 24/7 – all the garbage stirred by the affair. Where does your pain come from? And where do these thoughts come from? They come from what you have been taught and absorbed the myths and misconceptions, about infidelity. Here are two common myths that stir up terror in your heart. My spouse fell out of love with me and in love with someone else. Please know this is a crock. Infidelity has absolutely nothing to do with love. I has to do with an emptiness or a now bankrupt coping mechanism within your spouse that has been there long before they met you. An affair is an attempt to escape from the reality of one’s self. Affairs are NEVER about love. Affairs are a symptom of a lost soul. Infidelity is not a mystery based on some starry eyed people “falling in love” outside the marriage. Please know that the affair has absolutely NOTHING to do with any “failure” on your part. EVERY marriage has it’s problems, but they are not an excuse for infidelity. There are many other misconceptions about infidelity that harm and not help your inner state or the state of the affair. Second, be nice, accommodate, don’t rock the boat (advice of someone who assumes you or the marriage failed) and time will heal and you will win them back. Here’s the problem: Affairs are NOT based on Common Sense. Affairs are acts of temporary insanity, not common sense. 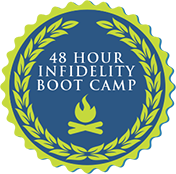 In the 48 Hour Infidelity Boot Camp I STRONGLY suggest you stop doing any of the 6 Killer Mistakes I talk about. These Killer Mistakes are based on Common Sense and they just plain don’t work. In reality they prolong your misery and the affair. BTW, two of the Killer Mistakes are suggesting counseling and trying to convince the cheating spouse that you love them. Once you understand the insanity of infidelity and refuse to buy into the Common Sense notion you feel better and you are better prepared to EFFECTIVELY address the infidelity. Once you get this victim thing turned around your world changes. Your Cheating Spouse is the Victim, NOT You! You feel like the victim don’t you? I don’t want to minimize your pain and terror. It IS real. And right now you experience yourself as the victim. Infidelity brings up a TON of primordial feelings that at first put you on overwhelm. Abby spent sleepless haunting nights and resorted to Lexapro so after D-Day she could function. Tracey could barely talk in our first session, her throat constricted by the fear and pain. But the truth remains, the cheating spouse holds the greatest danger of a downward spiral. Here’s what I’ve learned about cheating. A cheating spouse knows the affair relationship is temporary. A cheating spouse (a part of them) knows the affair is not a good thing. A cheating spouse is having an affair to emotionally escape from something within. 95% of them who cheat later say it was a mistake. 90% of future marriages of the cheating spouse and affair partner fail. Infidelity is an act of temporary insanity. The cheating spouse is the victim, is pouring their life down a dirty drain and missing out on an opportunity. Integrate these concepts into your thinking as did Abby and Tracey. Your personal power will be magnified and you will be free to effectively address the infidelity. You also feel like you’ve lost yourself. Where did “you” go to? Your life becomes wrapped around and deeply entangled in the betrayal. on the terror of losing it all!! You doubt your worth. You have more questions than answers. The first work of Abby and Trace was counterintuitive… creating some “space” between them and their cheating spouse. The first work of Abby and Tracey was counterintuitive…creating some “space” between them and their cheating spouse. Abby and Tracey affirmed what was true, found their voice and found themselves. Within that personal power they were able to act differently and breathe more deeply. Find yourself and you find your power. And as Tracey noted, her cheating spouse raised his eyebrows. And HE began pursuing her. What happened to this person who once so deeply loved and cared for you and is now emotionally a million miles away? Discovering the TRUTH about infidelity will provide comfort, set you free and help you develop your plan of action. All affairs are not alike. and personal history of the cheating spouse. Once you know the type of affair you can pinpoint exactly what you can say and do to disrupt the patterns. A Vital Key to understanding your cheating partner and discovering the TRUTH about infidelity is found in my Ebook, “Break Free From the Affair,” Level 3 of the Infidelity Recovery Center. You might want to go back and read what others had to say about the results of reading this book. Once you read “Break Free From the Affair you will..
YOU WILL HAVE AN IDEA OF HOW LONG THE AFFAIR WILL LAST. You want it over with, now, don’t you. You want the affair to stop. Well, each affair has a shelf life, which differs according to the type of affair. “Break Free From the Affair” gives you a time frame for your type. YOU WILL UNDERSTAND YOUR PARTNER’S MOTIVES FOR THE AFFAIR. Why? Why the cheating? Why now? I never saw it coming. What happened? Your spouse cheated because of unconscious and untapped motives. You begin to read your spouse better than they know themselves. YOU WILL ASK YOURSELF POWERFUL QUESTIONS ABOUT YOUR MARRIAGE. For each type of affair I ask some scary and direct questions related to the marriage. These questions MUST be asked an attempted to answer before you go further. And, when you do address them honestly most experience an surge of relief flow through their body. Some affairs are more deeply engrained than others. Is there hope? What does it mean to have hope? Tracy didn’t know how to act or what to say around her cheating husband. Discovering infidelity robs you of your future. You see no further than the next day, sometimes the next hour. You have no idea of what to do. Your life is wrapped around your pain. “Break Free From the Affair” not only untangles you from the pain; it gives you a plan. And with a plan, you look into your future with more optimism. If you had any emotional investment in your relationship, your cheating partner is still hooked to you. It may not be apparent, but it’s there. One eye will be watching you. An important part of Recover is overcoming your isolation. Family and friends and even a large portion of the helping community are clueless when it comes to supporting and guiding you in your struggle with infidelity. You feel isolated and on your own. You may think it’s not wise to divulge your ‘secret’ to others for fear of upsetting your cheating spouse or seemingly making recovery more difficult. Or you also think that if there is recovery, that you would need to repair the damage done by talking to family or friends. And of course, in our society there is a large amount of guilt and shame associated with having a marriage marked by infidelity. So you seem to be alone, with your thoughts, your pain and overwhelm. 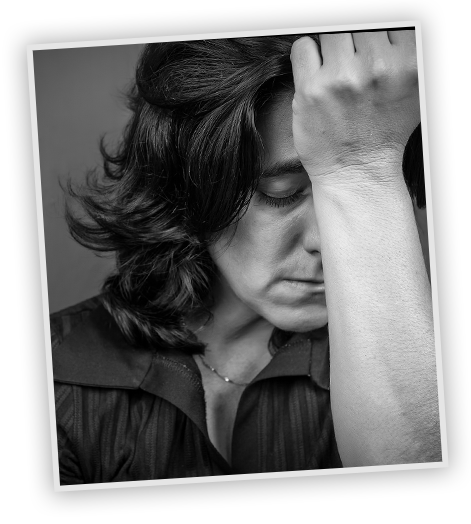 Once you register for the Infidelity Recovery Center you will know that you are not alone. I’ve conducted a number of Q&As over the past few months, proven to be invaluable for other asking their questions and sharing their stories. You will find in them a ‘home’ where you begin to identify with others and realize that you are not alone as well as learning some valuable information about infidelity. Here’s a list of the Q&As posted. I hope you feel a measure of relief, knowing there is a route you can follow through the maze of painful feelings and confusion. I offer hope, a route that thousands of others, like you, have a successfully taken. 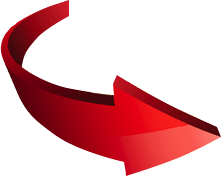 This hope, direction and route is found in the Infidelity Recovery Center. Here’s a focus on the first 3 Levels. In the Welcome Module you learn more about my background and my mission. In the 90s one of my clients was stabbed to death by her husband. I take your safety very seriously. 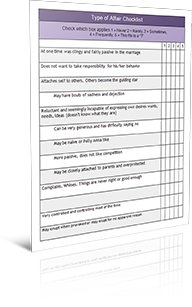 In this module I offer an extensive survey that helps determine your level of safety and actions steps if needed. Should you share this information with your spouse? That decision is based on 4 key factors which I share in this Module. 7 Types of Affairs Cheat Sheet. Use this cheat sheet to understand the craziness of the affair. Affairs are messy. They are always selfish and very painful. Cheater, Cheater Affair Repeater is a great introduction to the seven types of affairs. 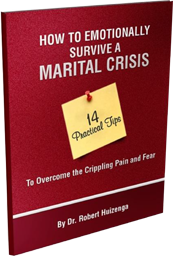 When a marriage crisis invades your life you find it extremely difficult to maintain your focus on the core issues in your marriage crisis. I describe 3 Powerful common barriers and ways to shift and maintain your focus, enabling you to build a relationship you trust will last forever. An introduction to Personal Coaching. To feel less isolated, rebuild your emotional power, move toward resolution of your crisis and speak more powerfully use Personal Coaching. Accelerate your healing. Focus. Finish. Watch the videos, read the transcripts or download the audio of the 21 half hour Q&A sessions with me as I respond to live participants. You will find a wealth of practical information and powerful interactions that keep you on your recovery path. Answer these 42 True/False questions about infidelity. Click the submit button to see your answers, your score and the correct answers. A brain teaser that helps you rethink infidelity. The purpose of the Boot Camp is to help you find relief quickly and see results quickly. For some the type of affair jumps out at them. For others, their is more confusion. 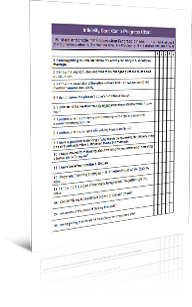 This module presents a 70 question survey, with a rating system, helping to you objectify the process of discovering the type of affair. Remember, knowledge is power. These 14 tips and strategies will enable you to see the world a little differently and approach yourself with more understanding and calm. Others, at the end, tell their stories of using these tips. Are You Making One (or all) of the 6 Killer Mistakes? 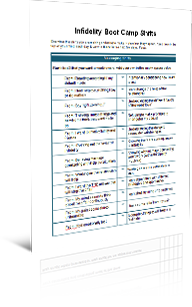 I outline for you, in this report, the 6 most prominent and common Killer Mistakes that prolong the affair and your misery and, in reality, probably strengthen the bond of the affair relationship (depending on the type of affair.) Experiment with refraining from using any of these tactics for the next 7 days. Boot Camp Shifts. Examine the shifts you are making or desire to make. Note when they happen. Keep them in the top of your mind each day. Live with them for the next few days. Focus. What is changing and shifting? You may not think you or your situation is changing, but change and shifts are always in action. Review what you learned and what you were able to implement. Your first step is to read “Break Free From the Affair” found in this Level. 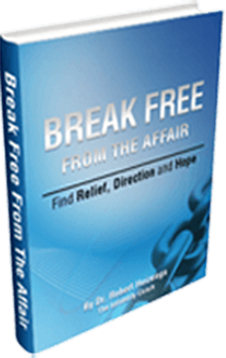 “Break Free From the Affair” has impacted thousands and in a concise but thorough manner invites you to look at infidelity in a radically different and freeing way. The first e-book on infidelity, “Break Free From the Affair” written in 2002, has been used by tens of thousands to help a alleviate the pain of infidelity, determine the type of affair and create a strategy that changes of the course of the affair and the marriage. … transform your experience of arguments and upsets in your relationships. Rather than avoiding confrontation and “walking on eggshells”, you will be able to safely and constructively talk about things that are hard to talk about. This guide, written by someone who has been-there-done-that, includes effective ways to find out if your mate is cheating. This material is very useful for anyone who suspects sexual affairs or cyber affairs. Ten Important Questions to Ask Yourself. These questions will Tell you if Saving Your Marriage is possible. 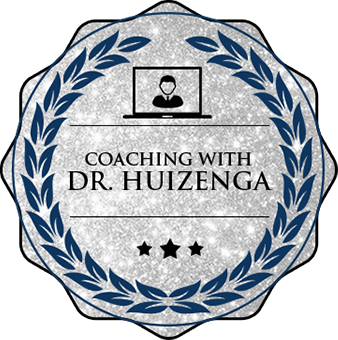 Also..
You have access to Dr. Huizenga’s private Facebook Support Group with over 20,000 members. Read, learn and participate if you like. Back off from your spouse or situation. Don’t make any decisions. Put that on hold. Don’t think about the cheating. Affirm yourself; let you know that you really are ok, have worth, value, etc. Develop understanding (and maybe even a little compassion for your spouse.) You married them right? There must be some good somewhere. Prepare to act in the coming weeks and months with targeted words and actions that have power and purpose. Start with Level 3, the Affair Recovery Module. Download “Break Free From the Affair” and devour it. Thousands have reported dramatic shifts. Dear Dr. Huizenga,I just bought your book yesterday and all I can say is thank you. I was on a emotional roller coaster when I found out that my wife was having an affair (#4). Everything you said about the typical reactions for the offended were dead on. Everything you mentioned, I was going through (I was miserable). You helped me more than anyone or any resource ever did. It was uncanny how accurate everything was. I couldn’t believe how accurate your description was of him – he is definitely number 3 but I don’t feel he has always been which is the sad thing really. Identifying the kind of affair made such a big difference in my state of mind. “I cant’ say No” brought it all home for me. I have confronted him before, but he tells me I’m crazy and paranoid. He is such a smooth operator. For some the type of affair is obvious; others bump into some confusion. Don’t worry, confusion is often an indicator of better success than being able to pinpoint right away the type of affair. If confused go to the Boot Camp Level, the Identifying the Type of Affair Module and complete the 70 question survey for a better understanding of the type of affair. Once you have some idea about the type of affair and feel more calm, go to the Boot Camp and the “Are You Making One (or all) of the 6 Killer Mistakes?” Module. The 6 Killer Mistakes are based on Common Sense. But, remember affairs are not Common Sense. Understanding the whys and wherefores of the Killer Mistakes is CRITICAL in rethinking infidelity. Refrain for at least 48 hours doing any of the Killer Mistakes. You are now on the Recovery Path. Here’s a very special offer. If, at any time during the 48 hours you are really struggling, confused, want direction or have a need to talk through your situation, email me and I will set up a 15 minute consultation via phone or gotomeeting. I want to be there for you, personally. I want you to know you are not alone. Is confronting the other person helpful? and 19 Live Recorded Coaching sessions with my written notes, evaluation and helpful tips. Personal Coaching, But Not Now. You may be in a world of hurt right now and think that one on one coaching with me would be wonderful. But, I want you to first go through the first 3 Levels of the Infidelity Recovery Center. I’ve found that coaching is exponentially more helpful if you are familiar my materials, especially “Break Free From the Affair” and the 6 Killer Mistakes. Coaching then is focused and as well, you more than likely have stronger emotional legs under you. I will check in in the next couple of days, see how you are doing and then we can discuss intensive coaching. Many use the free 15 minute phone consultation as a testing ground for coaching. 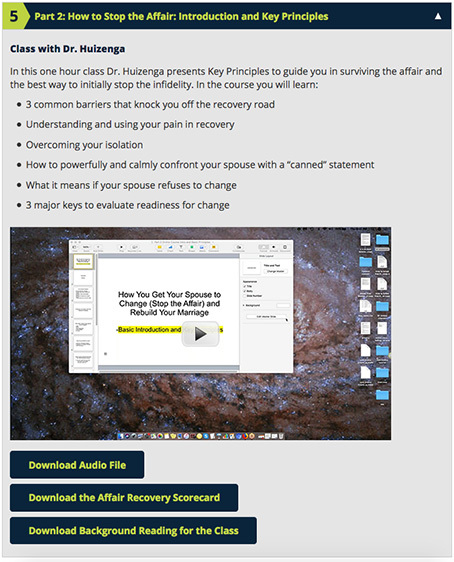 For now I want you to get started on the first 3 levels of the Infidelity Recovery Center. Click this button below and for only $73 you gain immediate access to the first 3 Levels. 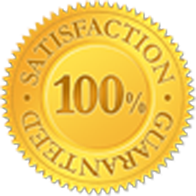 Access to the first 3 Levels of the Infidelity Recovery Center comes with a 100% Money Back Guarantee. If you are one of the small percentage who do not find any part of the 3 Levels helpful in the next 30 days I’ll refund your money. No questions asked. You can keep your username and password to the Levels. In 5 minutes you can be on your way to pinpointing the type of affair, stop shooting yourself in the foot with Killer Mistakes and open the door to a new world of grasping the TRUTH of infidelity which will set you free and on a new course of recovery. And, I will make the decision ridiculously easy. You may be feeling the devastation. You may be terribly confused. Your world is shattered and you may see no end to the pain. Please know that change can and does happen. My readers and clients show and tell me of their success. They have succeeded and so can you. Infidelity is NOT the end of your world. In reality, infidelity is often a wake up call, a cry for help and an impetus to find something better. This is your time for something different. This is your time for recovery.